Drivers are reported to be suffering delays in both directions around junction 27 for Standish. Two lanes have reopened following an earlier closure on the southbound M6, says Highways England. 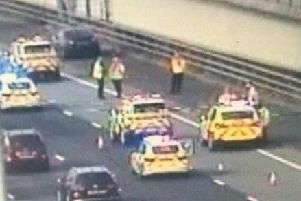 Drivers are reported to be suffering delays in both directions after two cars collided at junction 27 near to Wigan. Highways England are advising drivers to approach the scene with caution. A spokesman for said in a post to Twitter: "Lancashire M6 we have 2 lanes closed southbound between J27 and J26 due to a 2 vehicle collision. "Our TrafficOfficers are en route to assist @NWmwaypolice Please approach with caution." Highways England confirmed that nobody was seriously injured in the incident.